After a group Molvi’s determined that the Khanjar Galli grave is fake the same was removed at 3.50 am on early Wednesday morning. The Inspection of that grave had begun at around 1 am and after the decision of the Molvi’s the same was removed in heavy police presence. “Na Kabar mili na Mazar” with this statement the issue of the controversial grave came to an end. The Ulema of Bijapur who led the team said this after the 2 hours of digging the site. Earlier on Tuesday prominent members of the Muslim community in the city led by Shahalipasha Inamdar, Shajjad Nashim and Trustee of Bashiban Dargah, Belagavi, on Tuesday urged the district administration to maintain status quo on the controversial grave at Khanjar Galli till the High Court Bench at Dharwad disposed of the writ petition on the matter. 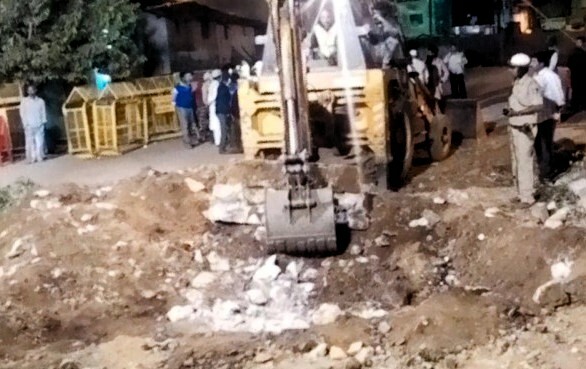 It may be recalled, a fresh controversy had erupted over the surfacing of a grave in Laxmi Market off Khanjar Galli after the demolition of a Hubballi Electricity Supply Company bill collecting centre there two months ago. It is known that the supreme court has listed some of the places of worship which are built on the Govt.land and has directed the Govt to remove or demolish these structure .The Corporation should come forward to act according the direction of court .Anything which comes under the infrastructure development like temples, mosques churches, autostand, taxi stand, commercial stalls etc should be removed, Using of loudspeakers, horning by vehicles near hospitals, educational zone etc throughout the year and all day long needs to controlled. It is said that the supreme court has listed some of the places of worship which are build on Govt.land and has ordered to be demolished .The Govt. should follow the direction and make our city free from all such hindrances . HAPPY BELGAUM FOR ALL CAST. Anything which comes under the infrastructure development like temples, mosques churches, autostand, taxi stand, commercial stalls etc should be removed, Using of loudspeakers, horning by vehicles near hospitals, educational zone etc throughout the year and all day long needs to controlled. And Lakes, gardens, tourism area development, planting of tress side by the roads needs to be encouraged, this is my point of view, hope this will be every once view. what about Datta mandir and other small temples coming under goaves to third gate road widening? will administration shift these temples or what action they will take? Belgaum Muslims are grate, and I am very happy for the sake of peace we removed the grave. every miscreant learn the lesion we all Belgaumite ( Hindu, Muslim, Christian etc.) have unity for peace of our city. Well said, lets live in peace..